If you are invited to a party or an event, and if you don’t want to go then you”ll have to came up with a reasonable reason to the one invited you so that they will not get offended… but how would you feel if they are being very honest with their reasons? I don’t think being too honest is such a good idea. COMMENT and share if you’ve done this with your friends or anyone who invited you. 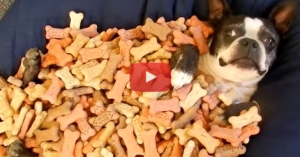 This Dog Is Lying In A Bed Full Of Treats…It’s So Comfy, He’s Not Sure What To Do!